While we tend to think of lynchings as an act by a few hateful individuals, the reality is that often times it was an event for the whole family. Many times as seen above, the whole town came out to watch the black body swing until the last breath has gone out. Often black males were castrated before they were lynched. 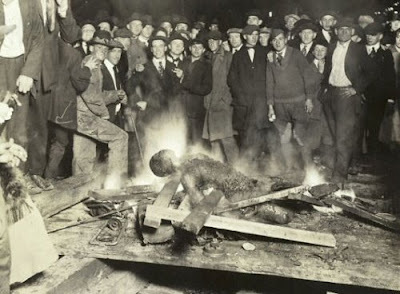 Many were also set on fire as this picture depicts. Pictures then would be taken with the townsfolk posing (often with grins) in the background. These public spectacle lynchings were especially common the first few decades after the civil war and the abolition of slavery. This kind of thing disgusts me. The closest thing to it is the pictures of hunters with their trophy kills. I wish the Federal Government would have stepped in and used these pictures to round up and charge all the people in these pictures. I pray that God was able to convict these people of their sin and to help them repent and make restitution as best as possible. I would also pray that God would seek out this type of sin in me because I’m not above such behavior without him. Wow… that’s kinda deep, never even thought about it in comparison to hunters taking pics of their trophy kills. As far as using the pictures to round people up, at that time they knew it was socially acceptable, and did not hesitate to take pictures in front of the camera. Which of course was a big deal since they didn’t exactly have digital camera’s in their backpacks ya know. They had no fear of legal repercussion, and the government really had to eventually be coerced into protecting people from being lynched. I think this history helps us all to understand the capacity for evil any group can have when they have power over another group of people. It is much easier than we can imagine, to become callous to the humanity and suffering of others. Thanks for sharing, and I am curious what you will think of the latest post….